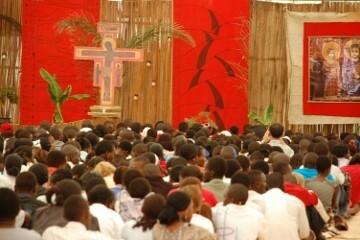 The Pilgrimage of Trust in Kigali, to be held from November 14 to 18, 2012, will be an international meeting for young people, a step along the “pilgrimage of trust on earth”, begun by the Taizé Community’s founder the late Brother Roger. The most recent stages of the pilgrimage were held in Asia (Manila, 2010), South America (Santiago del Chile, 2010) and Europe (Rotterdam, 2010). Several thousands of young people will gather from Rwanda and other East-African countries. There will also be representatives from South Africa, Madagascar, Sudan, Zambia, Malawi, DRC ... and from Europe, America and Asia. The aim of the meeting is to celebrate Christ, to go together to the wellsprings of trust and renew our commitment in the Church and society. Common prayer (with silence and meditative singing), Bible reflection, sharing of life experiences, hospitality in families and local Christian communities will be the central elements of the meeting. The morning programme will be organised in the parishes of the city and surrounding area (morning prayer, visiting and meeting with “people of hope”). The afternoon programme will consist of Bible reflection, sharing in small groups, workshops and seminars on various themes (social issues, cultural presentations ...). Participants will be accommodated by local Churches in families.